This movie, Sunday, is one that’s easy to forget. It’s best not to look at it critically, that is from the aspect of acting or story or direction! That means it’s bad, right? Well, many reviews trashed this movie, but the Times of India gave it three stars. That surprised me, because the Times has given two stars to movies better than this one…anyway this isn’t a review of a review so I’ll be getting on. The movie is a murder mystery of sorts…don’t worry I am not going to spill the beans right here. If I do, it won’t be worth watching the movie. The movie starts with a murder of an anonymous young woman by her lover, and right till the end we are not sure how this murder is connected with the main characters and well…with another murder which happens in the second half. The director does manage to keep up the element of mystery till the end, but the end is disappointing. In an intelligent murder mystery the story-teller leaves enough clues for the viewer to take a stab at who the killer is, but here it’s impossible as no one seems to know what’s happening…not even the characters in the movie, not until the end. There are no clues as such left to examine, it’s all about following a trail…and the killer is finally exposed by a string of rather unbelievable coincidences. The movie is a thriller-comedy. The director, Rohit Shetty, the director of the successful Golmal, has attempted to make almost every scene comic and that is why some scenes seem awfully forced. Arshad Warsi who plays a taxi driver does a good job though. Irfan Khan seems eminently unsuitable for the role. His role, where most of the time he dresses up in ridiculous costumes was pretty stupid. He wasn’t even a side-kick, but a side-kick of a side-kick. What a waste of an excellent actor. The main characters in the movie are Rajvir Randhava (Ajay Devgan) a crooked cop who goes around taking bribes and eating ice-cream cones, a young working girl Seher (Ayesha Takia) who goes around on a scootie, talkative Ballu (Arshad Warsi) and his buddy Kumar (Irfan Khan) who go around in a taxi. These various characters do not know each other at first, but as the story unfolds, they meet. Ayesha plays the girl next-door pretty well and her innocence and freshness are right for the tole. She acts all right, and as for Ajay Devgan, he goes through the whole film with his typical frowning expression, even when he is wooing Seher! As for that item number by Esha Deol, that’s forgettable. The action scenes are unoriginal. The music is so-so and for more details on the music you can read this music review. This film review makes it seem as if the movie isn’t worth watching. Well, if you not a Bollywood fan, avoid it like the plague. If you like to see select Bollywood movies, avoid this one. If you like Ajay Devgan, are curious about what Rohit Shetty has on offer this time round and have some time to kill, well…see it then. It’s average fare of a different kind. What we call T.P. (Time Pass). @Nita: You are mild even when you criticize. I am sure I would have shredded the movie and its actors for it, had I felt it were “TP”. And yes, I will avoid it like the plague. Happy New year!!! I think this is my first comment here this year. Goodness, a new movie with Ajay Devgan. You see something Nita, this is one actor I believe should just get vexed and write his own scripts. I am yet to see him in anything that gives him the opportunity to shine like he deserves to. I almost cried when I saw the movie Cash (or at least that is what I think it was called)…why would anyone put the dude in muscle tops and blonde spiky hair? What was Kajol looking at? It isn’t bad Nita. Infact I read your review after I had posted my views on the movie. It is not very different from the other Rohit Shetty movies but Irfan Khan made a difference. I am a big fan of Irfan. A normally ferocious looking Mukesh Tiwari made me laugh in ceratin scenes. It was not a classic comedy like Chupke-Chupke or Angoor but it does bring smile to your face. Ajay Devgan. If you like him then it’s worth seeing this movie. Prerna, true, the movie isn’t that bad. It does make one smile. Certainly better than movies with all the rona dhona. This movie could have been made better. As it is, it was remade from a telugu movie “Anukokunda oka roju” released in 2005. It is a really good movie, woth watching if you have the patience to read the subtitles on the DVD. As I recall, the original telugu version had comedy sewn into the situations, while the suspense was not tampered with. Only issue was it had a tad more songs than I liked. Otherwise a very good movie and a must watch. Avoid. Could have been made better. 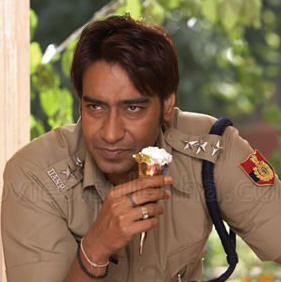 Ajay Devagan is irritating especially when is licking the icecream cone in every scene. This guy cannot act and he looks very lame when given a comedy scene. Warasi and Khan are good and have tried their best to entertain. Takia is good and have played her role fairly. Story line is good but the way it has been presented, lacks the charm. random question and you may not know the answer but…what drug was it that made her forget about the previous day…? it’s stupid i know but i’m just curious, is that really a drug?